There are people in El Salvador who will tell you that they’re afraid to go anywhere near the town of Suchitoto. 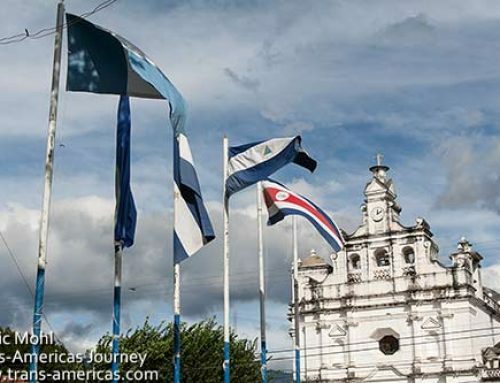 Why would otherwise sensible and intelligent people refuse to visit a lovely town like Suchitoto? Because El Salvador’s civil war didn’t end until 1992 and some of the earliest fighting and worst atrocities of that war happened around Suchitoto. 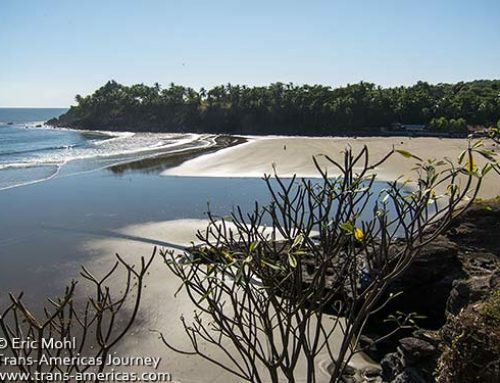 For us, this is where El Salvador’s civil war, something we (and most North Americans) only vaguely understand, got real. “honors”). For twelve years the military-lead El Salvadoran government did everything in its power (which included arms, training, and expertise from the United States totaling millions of dollars) to wipe out a rebellion spearheaded by a group called the Farabundo Martí National Liberation Front (Frente Farabundo Martí para la Liberación Nacional in Spanish), aka the FMLN. At the beginning of the war the FMLN was a coalition of five different revolutionary groups united against the government. On a side note…when the Peace Accords were signed in 1992 the FMLN switched from a guerilla/revolutionary group to a legitimate political party. The FMLN is the current ruling party in El Salvador. But we’re getting ahead of ourselves. The FMLN is named in homage to a Salvadoran leftist named Agustin Farabundo Martí Rodríguez, a legendary figure credited with opposing exploitation of the poor and helping to develop communist movements around Central America. The real Farabundo Martí died in 1932, nearly 50 years before the El Salvador’s civil war started. 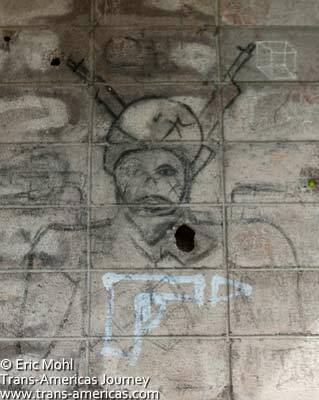 Civil war leftovers are found everywhere in El Salvador. These are on display at a restaurant near Suchitoto. No matter which side of the political fence you were on in El Salvador in the 1970s you had to acknowledge the power of Archbishop Oscar Romero who had the trust and the ear of the poor and powerless which made up most of the population of the country. If you supported the FMLN, Archbishop Romero was a hero. If you supported the government, he was a target. Archbishop Romero was assassinated by government death squads while celebrating mass in San Salvador on March 24, 1980. Two weeks before he was gunned down Archbishop Romero said “If they kill me, I shall arise again in the Salvadoran people.” He was right. El Salvador’s civil war began with his death. The church in Cinquera, El Salvador was rebuilt after the town was nearly flattened during civil war fighting. 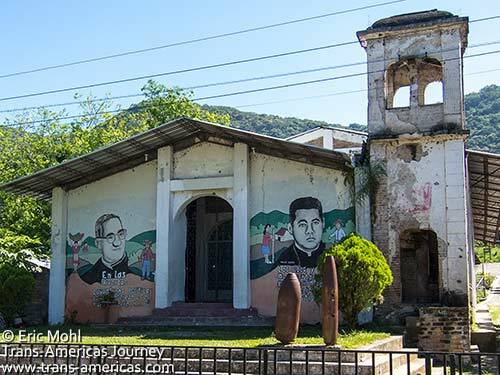 The bullet-riddled bell tower (right) was preserved and propped up and bomb casings now adorn the entryway along with a mural showing Archbishop Romero (left). The area around Suchitoto was (and is) a hotbed of support for the FMLN. 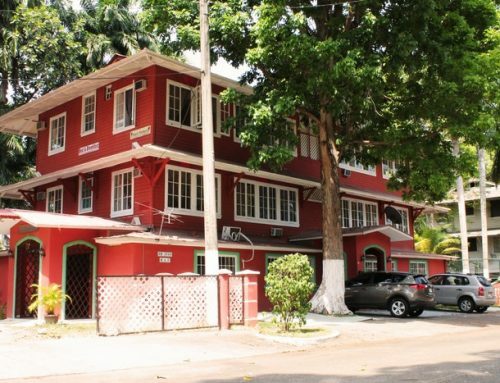 Some of the earliest FMLN training camps and bases were in operation in the area and the government built a garrison in the then nearly deserted town of Suchitoto as a base for surveillance and attack. Some of the earliest clashes between the two sides took place here and it just got worse as the civil war dragged on. An unknown number of men, women, and children “disappeared” across El Salvador during the war and more than 75,000 people are confirmed to have been killed on both sides. 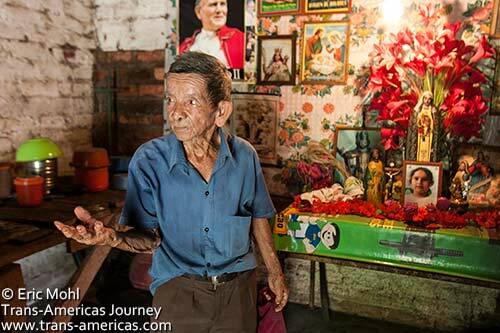 In the Suchitoto area every household has a story of profound loss during the war. People recount stories about the abductions, disappearances, executions, hiding, running, fear, deprivation, and persecution that happened to them. 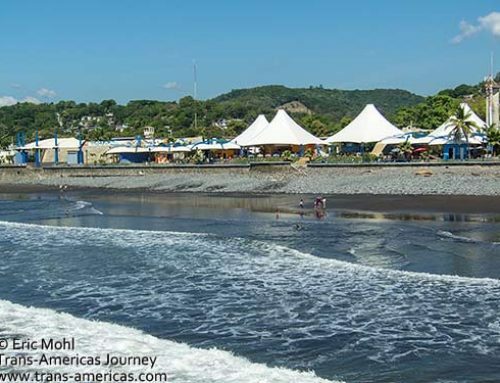 El Salvador’s civil war didn’t occur in the distant past to people who are long dead. 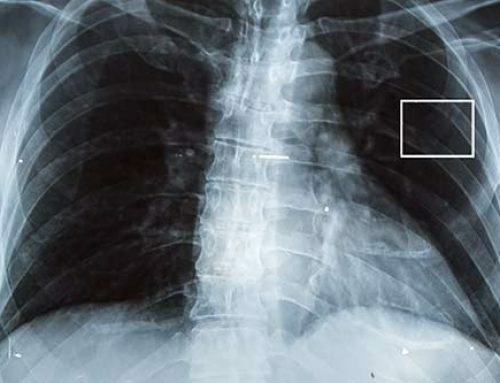 The horror story you’re hearing about hiding under dead bodies or watching soldiers drag another son away happened to the person you’re talking to. 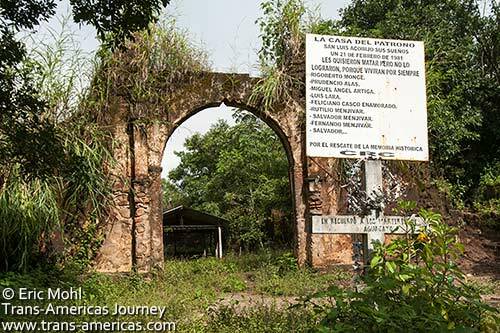 The remains of an old military garrison on the outskirts of Suchitoto where, we were told, many not very pleasant things occurred. It’s now inhabited by squatters. In search of a deeper understanding of what went on here in the not-so-distant past, we went to a bar. But not just any bar. Bar El Necio in Suchitoto gets its name from Ernesto “Che” Guevara’s first nickname. The place is plastered with FMLN posters, memorabilia, pictures of Che and revolutionary slogans plus some still-live munitions. Substitute Martin Luther King Jr’s face on the posters and you begin to get a small understanding of the racial, social and economic struggle the FMLN represents here. At the time Suchitoto native Luis Carranza, better known by his nickanme Sapito or little toad, was the El Necio’s gregarious bilingual bartender. In addition to slinging a mean cuba libre (how appropriate), Sapito leads tours beneath the surface of Suchitoto’s FMLN legacy and civil war history (he’s now guiding full-time). It’s a subject he knows a thing or two about. As she sipped coffee and smoked cigarettes, Sapito’s mother, an FMLN supporter, tells us that when she was nearly nine months pregnant she attended the funeral of a priest who had been killed by government death squads. Her presence at the funeral made her even more of a target than she already was and neighbors warned her that the death squads were coming for her next. She grabbed her baby girl and, along with a few other FMLN supporters, ran into the jungle. 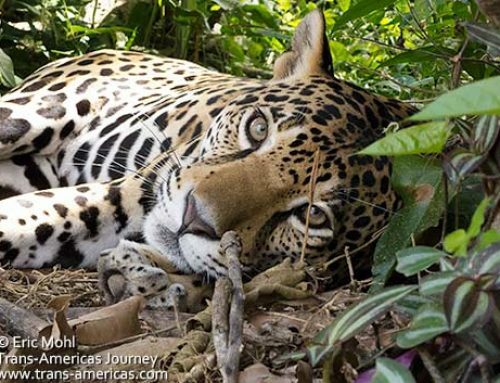 Soon she was having contractions which forced her to hide just off the trail where she gave birth to Sapito. She tells us this with a matter of factness that’s more than just resigned. She sounds as if she has successfully put such a thing (and more) in the past. She sounds like she’s found a way to move on. It’s us who fight back tears. Graffiti near Suchitoto, El Salvador. To be fair, not all of the atrocities were committed by the pro-government forces. The FMLN stands accused of abductions and murder as well, though the guerillas’ piddly resources (augmented with donations from Cuba and Russia) limited their ability to commit these acts while the US-backed Salvadoran military suffered no such limitations. For example, in January of 1986 the Salvadoran military, aided by United States military advisors, launched “Operation Phoenix” (named and modeled after the operation of the same name in Vietnam) in the Suchitoto/Guazapa area. 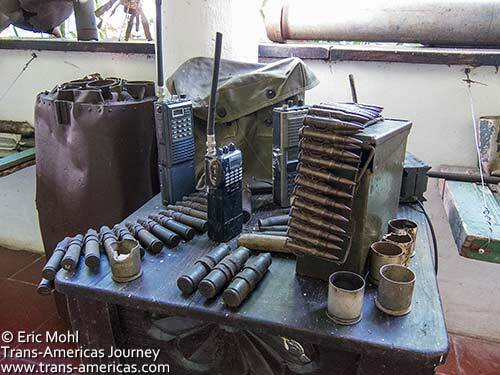 As part of the operation, a village called Aguacayo just a few miles from Suchitoto was bombarded. Twenty two civilians were killed and 213 others were captured or “disappeared.” By the time the operation was over 22 villages were burned and over 2,000 people were displaced. “Operation Phoenix’s” scorched earth tactics, as described in this Los Angeles Times story, destroyed homes, fields, livestock and people. The attack was part of a strategy to remove the civilian population from the countryside to keep the FLMN guerillas from having contact with them. 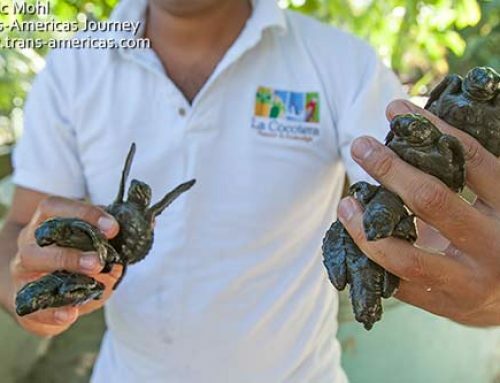 For more about this campaign of destruction check out the documentary Return to Aguacayo. Aguacayo church was destroyed in 1981 bombings even before “Operation Phoenix” wiped the village off the map in 1986. US backed Salvadoran government forces certainly succeeded at scorching and burning. 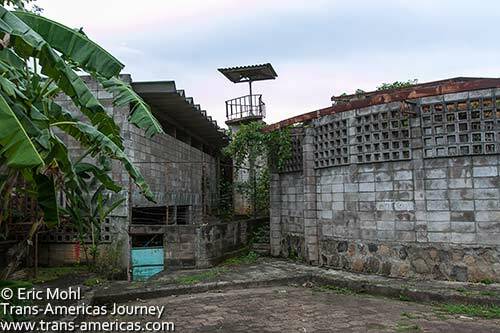 Sapito took us to Aguacayo and even today the town is a propped up shell consisting mainly of overgrown foundations of houses that were never rebuilt and the skeleton of a church with a metal shed inside it for services. After hollering out cheerfully for a few minutes an elderly couple recognized Sapito’s voice and came out to greet him and invite us into their very humble home near Aguacayo. The woman, in the clutches of dementia, said little. But her husband, fully aware of why we were there, was willing to share some of his experiences during the civil war, including the loss of his daughter which he slowly recounted as we stood in front of the family’s shrine to the dead girl. 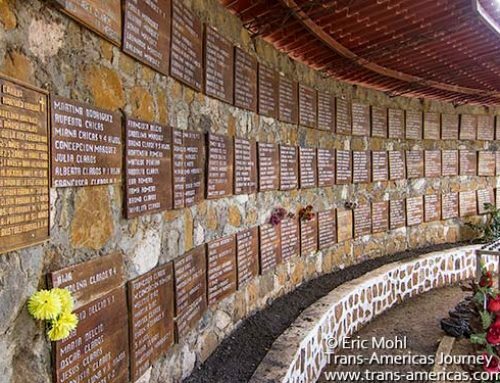 A man who lived through El Salvador’s civil war tells us about the war-time murder of his daughter as he stands in front of the family’s shrine to her. 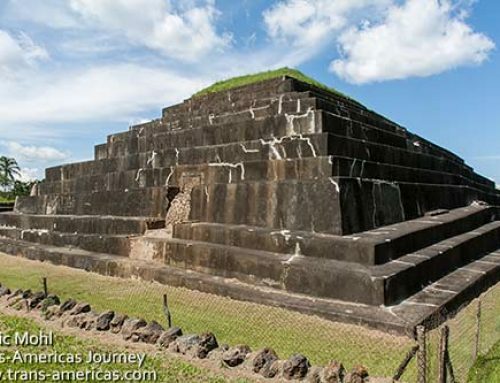 We took ourselves to the town of Cinquera about 12 miles (20 km) from Suchitoto. Though Cinquera was also bombed to smithereens and most of its inhabitants killed or expelled, this town has been rebuilt, often using the detritus of war to do it. The dusty central square is home to the tail section of a downed helicopter. Fences are decorated with old machine guns. The shells of 500 pound bombs have been positioned just so around the church, like sculpture. 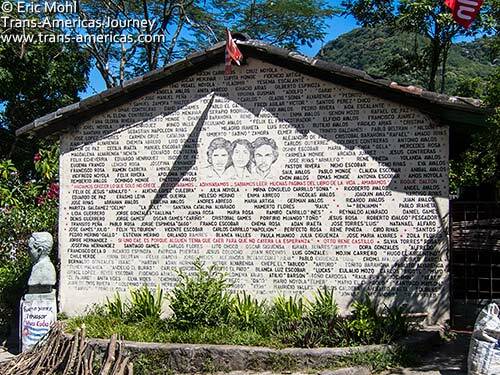 Names of locals killed in El Salvador’s civil war are painted on this wall in Cinquera. All of the buildings in town had to be reconstructed, mostly in cheap, drab cinderblock, including the church. However, the bullet-riddled bell tower of the church has been preserved and propped up as a kind of monument. FMLN posters are up on every street. There’s a crude bust of Farabundo. Murals list the names of locals killed in the conflict. Of all of the civil war battle sites we visited Cinquera feels most like a tinderbox. For more about Cinquera, check out “The Tiniest Place,” a documentary made by Salvadoran Tatiana Huezo in 2011. 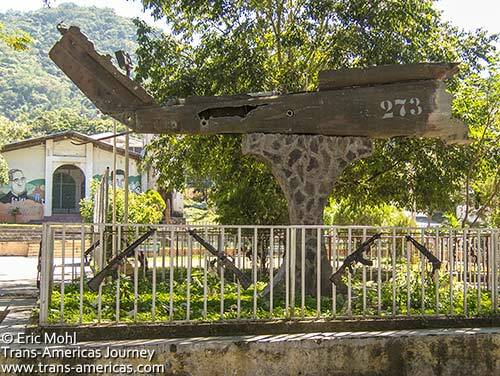 The centerpiece of the square in Cinquera is the tail of a military helicopter that the FMLN destroyed. Note the old machine guns decorating the fence. 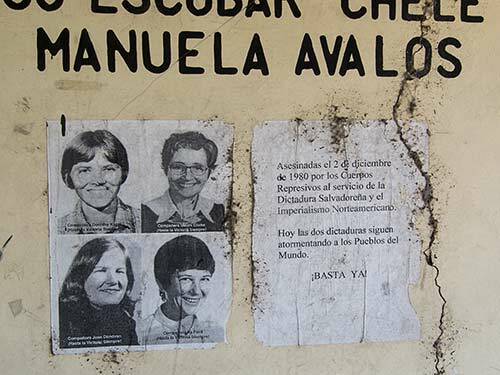 The faces of four nuns from the United States who were brutally beaten, raped, and murdered by death squads near the beginning of El Salvador’s civil war stand testament on a wall in Cinquera. There are also a number of non-war related activities around Suchitoto. 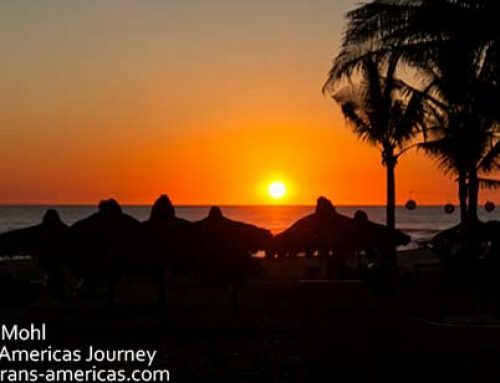 For example, the word Suchitoto means “place of birds and flowers” in the Náhuatl language and hundreds of species of birds live or migrate through the area. 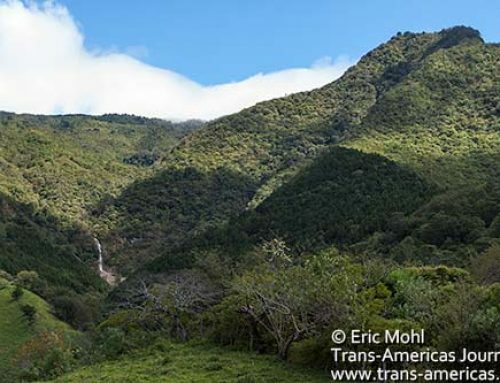 In October and November columns of migrating birds can darken the sky as they circle into thermals to help them get up and over El Salvador’s mountains and volcanoes. Guide training programs have taken place to promote bird watching in the area. 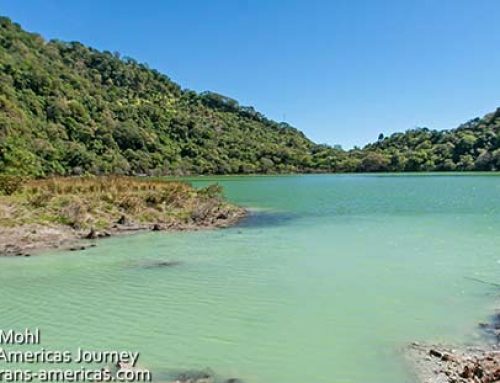 You can also take a zip line from the shore of Lake Suchitlan, below Suchitoto, across the water to a small island in the lake or tour the enormous lake in a small boat. 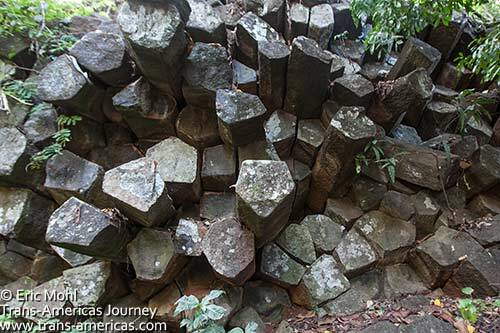 We wanted to check out Cascada Los Tercios, a few miles from Suchitoto to see the hexagonal stone spires, created in an ancient volcanic event, that form a dramatic jumble of rock over which water tumbles. 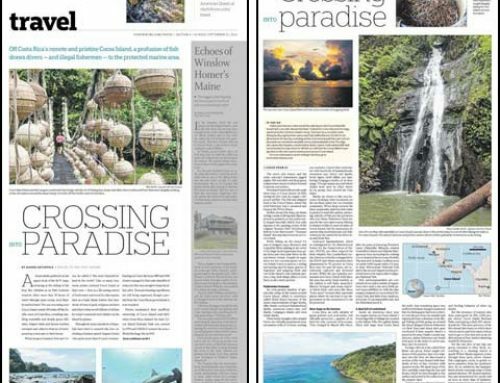 However, robberies had been reported at the waterfall itself and we’d been advised more than once to take advantage of a unique service in Suchi: free police escorts. The unusual columnar basalt rock formations of Cascada Los Tercios near Suchitoto, El Salvador. So we walked into the police station, told the officer we wanted to visit the waterfall and before we knew it we were in the back seat of a police SUV being driven and escorted by two uniformed officers (one for each of us!). The drive to the waterfall was dusty and peaceful through tiny villages and past fields. Eventually the driver pulled over. He stayed with the vehicle and the other cop guided us through a fence, along a short trail through a pasture then down toward the waterfall. The columnar basalt rocks, formed like pillars, were almost jet black and very well-defined which gave them a man-made look. It reminded us of Devils Tower in Wyoming, a monolith formed by a similar volcanic rock phenomenon, which we visited very early in our Journey. It was nice to visit a site in the area that didn’t have civil war baggage and we think the cops liked the excuse to get out of the office too. 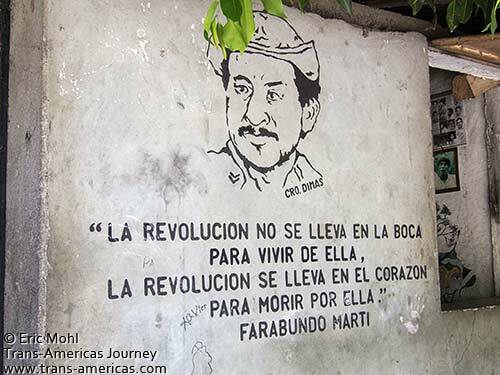 I think it’s important to correct the translation of the F. Marti quote on the wall: Revolution is not carried in the mouth to live OFF of it…. (rather than how you wrote ‘live it’) …the juxtaposition with the…but to die for it…makes more sense this way…. Thanks for the correction, after 2 years in Latin America our skills are still lacking. It’s scary to think this all happened so recently. Quite often wars become just a part of history but it sounds like it’s still very fresh for a lot of these people. Everytime I visit somewhere which has been affected by war, it just amazes me how wonderful people are at being terrible to each other. You sum it up well: no one wins a civil war. I’d extend that… no-one really wins war. People just manage to survive. Really incredible story. The revolution is actually what made me fall in love with Leon, Nicaragua. Such an unimaginable time for someone who grew up in Canada. 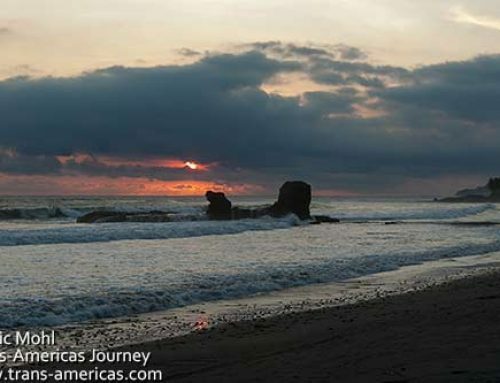 I didn’t go to El Salvador because I heard it was a bit dangerous but you are tempting me to go back. I think it’s important to go to places like this on our travels so we understand that there is nothing good about war and we aim to bring about peace within our own backyards.Its the only way we can bring true peace to the planet. HI everyone, I am doing a little research , I was born in the Honduran refugee camps, by my grandma, she applied for refugee status and was granted Canadian Status. Because of her my brother ans I have had the privilege to live in such a great country. Mt grandma lost my father and my four uncles in the war. The remains were never found, does anyone know how to find some archives of the disappeared? or records of unidentified remains found? I was wondering if there are organizations I can contact?